Luscombe Airfield was built at Nui Dat and officially opened on 5 December 1966. The airfield was named after Captain Bryan Luscombe (RAA), who was one of the early post WWII Army aviators. He was killed in action in Korea on 5 June 1952 whilst flying an air observation post mission as a member of 1903 (Indep) Air Op Flight - RAF. Luscombe Airfield late 1966 early 1967 (Photo from Ross Goldspink). The First Australian Task Force (1ATF) moved into the Nui Dat area in early June 1966, and units were deployed so that a compromise was struck between immediate and future requirements. On the one hand was a need for a fairly compact defensive layout around the Nui Dat feature; on the other was the requirement for early development of domestic roads, and provision of adequate empty spaces for eventual construction of essential buildings and installations. Not the least important of these installations was an airfield. With the wet monsoon season imminent, top priority for engineer base development effort was directed to construction of scale 'A' accommodation and access service roads to units, in the hope that units would not become mud-bound in their essential domestic activities. During the early stages of development of Nui Dat it was necessary for 161 (Indep) Recce Flt, a Task Force unit, to remain at Vung Tau with the First Australian Logistic Support Group (1ALSG), since the fixed wing light aircraft had to use the Vung Tau airfield. The initial master plan made provision for a Caribou standard airfield and a large landing area for helicopters, in addition to other facilities. Sites for the airfield and the main helipad were selected by 1 Field Squadron (RAE) based on the Task Force Commander's tactical and logistical requirements, the ruling airfield criteria provided by Military Aid Command Vietnam (MACV), and local advice from RAAF. In the initial laying out of the Task Force, three large tracts were left vacant within the area to provide for the airfield and a major heliport. Since all three of these areas were naturally fairly low and virtually below the wet monsoon high water mark, they were not attractive for the initial development. Since engineer effort was directed to other tasks and since the wet season had commenced, reclamation could not be attempted at that time. Between the Nui Dat feature (SAS Hill) and the Task Force rubber plantation was a natural cleared area which was used initially as the main helipad, and was known as Kangaroo Pad. By means of fairly substantial drainage and excavation, this area could be converted to a large heliport running east-west, or, with considerable more effort, a Caribou airfield with a number of fairly stringent restrictions. 2. To the north of Nui Dat just south of the rubber plantation which was occupied by 5RAR and to the east of Route 2, oriented east-west. The former location offered several advantages in the short term - the alignment was already fairly clear of vegetation; the road provided a ready-made (though narrow) runway, which could be widened and graded smooth; the entire runway would be dominated by the Nui Dat feature; and the ends secured by Task Force units; the airfield would be centrally placed for easy access from all units. Many disadvantages were apparent, however, particularly in the long term. The alignment was at right angles to the prevailing wind directions, these being east to west from November to February and west to east from April to September. The flight path of fixed wing aircraft would cross that of helicopters using Kangaroo Pad. The western flank of the entire length of the runway would be exposed to enemy observation and possibly direct fire from Nui Thi Vai Hills to the west. In addition this flank was vulnerable to enemy ground attack since there were no friendly units located west of Route 2 in this area. Immediate approaches from both ends were over rising ground and gradients along the centre line were too great for ultimate use by aircraft larger than Caribou. If excavation had to be done, the advantage of the ready-made runway was negated. Drainage for subsequent expansion of parking areas and service areas would be a major task, as there were two perennial streams crossing the road in this area. If Route 2 was used for the airfield it would be necessary to construct a bypass road so that civilians to the north could get produce to the markets in Baria and Vung Tau. Consideration of these, and other relatively minor factors, pointed to the ultimate location as the most suitable. This site too, presented some problems. Although most of the proposed area was only lightly covered with young rubber trees and scrub, the northern and eastern boundaries were covered with tall rubber, up to 45 feet in height - which provided cover for elements of 5RAR and 6RAR respectively. There was quite a pronounced cross-slope from the 5RAR area on the north side to a perennial watercourse running parallel with the proposed runway to the south. The space between 5RAR and the stream was obviously restrictive for proper lateral cleared zones. The pronounced cross-slope indicated a requirement for substantial drainage structures to carry run-off from 5RAR to the stream. The approach glide path from the west was across unoccupied ground to the west of Route 2, and the western end of the runway could be observed from the Nui Thi Vais. Eventual extension of the airfield to C130 Hercules standard would involve crossing Route 2 to extend the runway proper into unoccupied ground to the west. Notwithstanding these shortcomings, the advantages (or minimal disadvantages) made this site the most attractive for the Task Force air-head. During the first three or four months, while the bulk of the engineer construction effort was diverted elsewhere, there was little work done on the airfield site. Since the 5RAR area needed major monsoon drains to carry away run-off, these were constructed at proper levels, and in the right positions to fit into the drainage plan of the future airfield. To permit earthworks to continue at a later date, two 48-inch diameter corrugated iron culverts were installed under the runway alignment, each one being 150 feet long. Some clearing of the site was demanded during this period to permit construction of the northern limb of Canberra Avenue, which ran parallel to the airfield and provided major access to 5RAR. From time to time some additional patchy work was accomplished when machines were precluded from working on priority jobs by bad weather. As essential base development work had progressed well since June, priority of engineer effort was directed to the construction of a Caribou airfield in mid-October 1966. 1ATF operations were ranging further a field, and placing heavier demands on the limited available helicopter support for daily resupply from Nui Dat to forward operational bases. The Task Force Reconnaissance Flight was still located in Vung Tau. A detailed survey of the site revealed a dilemma for the airfield designers. Between Route 2 in the west and the 6RAR rubber plantation in the east there was more than sufficient length for a Caribou strip. There was, however, a total rise of 50 feet, with several natural hollows and bumps over the length of approximately 3,000 feet. After consultation with the RAAF, it was decided to accept the overall fall and adapt operating procedures to allow for it. It was decided that aircraft would generally land up-hill (towards the east), and take off down-hill exploiting the assistance of gravity, and avoiding a glide path over the 6RAR area. On the rare occurrences of strong easterly winds, procedures might have to be modified. In order to minimize excavation it was considered satisfactory to accept relatively large percentage changes in longitudinal gradients, provided they were within the limits of the MACV criteria - hence the dips and bumps in the airfield - not designed to provide ski-jump take-off assistance, as was suggested by one early passenger. A Caribou airfield would not require the full 3,000 feet which was available, so it was decided to attempt to construct the field to meet requirements of MACV criteria for limited use by C130 aircraft. The unique operating procedures made it possible to do this, since the over-run at the eastern end could be converted to extra runway. The runway could be extended at a later stage to the west of Route 2, to measure up, with some minor restrictions, to the standards for a fully operational C130 airfield. From the engineering point of view, it was desirable to accomplish earthworks as quickly as possible. Disregarding the formidable list of other tasks on the job-priority table, it was desirable to cut, fill, and compact the earthworks during the period between the wet monsoon and the dry season. It was hoped that it would be possible to work the soil at close to optimum moisture content, thus minimizing the need to haul and spread water for compaction, and for dust laying. The plant operators of 21 Engineer Support Troop RAE, under command of 1 Field Squadron, responded to the challenge in characteristic sapper fashion. Earthmoving equipment operated from daylight till dark, clearing, cutting, hauling and compacting. With the end of the wet season the soil quickly lost its moisture, and it became necessary to spread water to ensure adequate compaction. Improvised water tanks were constructed by reinforcing and lining large packing cases which had contained prefabricated metal buildings. Water was distributed and the airfield was rolled in pre-dawn darkness to minimize evaporation losses and to exploit overnight condensation. This operation was made possible by the co-operation of the APC squadron and the infantry battalions who provided standing patrols to the west of Route 2, while engineers worked in darkness. After about 50,000 cubic yards of soil had been excavated and the flight-strip had been graded and compacted, a covering of locally won laterite was laid over the runway and shoulders. The runway proper was clad with high quality leached laterite which was extracted from a quarry between 1ATF and Hoa Long. Some 5,000 cubic yards of this material were imported to provide a 9-inch thick compacted pavement on the 80 feet wide runway. On 31 October a Cessna 180 from 161 (Indep) Recce Flt conducted several 'proof landings' on the airfield, though it was far from complete at this stage. The purpose was twofold. The landings confirmed that the runway could be used in emergencies from that date. Plant operators working on the site had noticed FAC aircraft of the US Air Force doing low-level runs over the cleared area. While engineer graders and excavators pre-empted an American inaugural landing on the strip, a hasty engineer/aviation reconnaissance was arranged and a Cessna 180 was diverted from Baria to conduct the proof landings. By late November, the airfield was ready for inspection by USAF representatives. They required the removal of some 400 rubber trees from the eastern end of the airfield in order to certify the field suitable for use by Caribou and C123 and by C130 with Grade A pilots. This additional work was completed in time for the official opening of the field on 5 December 1966, the completion date which had been forecast in early October. At this stage the airfield was regarded as dry weather strip - since traffic during wet weather could damage the surface. A simple opening ceremony took place on 5 December before a small guard of honour of engineers and Army aviators, flanked by light aircraft and earthmoving equipment. Brigadier Oliver David Jackson, Commander 1 ATF, unveiled a commemorative plaque, naming the airfield 'Luscombe Field'. A Caribou of 35 Squadron (RAAF) landed on the runway, using only a small part of the total length available. Later in December the runway was sealed with 'Peneprime', a bituminous dust palliative. In the absence of crushed rock, sand was used with the bitumen. Even spreading was difficult to achieve without special equipment, and a technique was developed whereby hovering helicopters spread the sand and blew away excess material from the sealed strip. Repeated applications created a waterproof skin which enabled Luscombe Field to be used throughout the following wet season without damage. 1 Field Squadron (RAE) built workshops, parking areas and accommodation for 161 (Indep) Recce Flt in the rubber trees adjacent to the northern edge of the airfield, at the eastern end. Pre-fabricated metal airfield matting was laid over a plastic membrane to give a waterproof, dust free, parking and working area in the shelter of the rubber plantation. 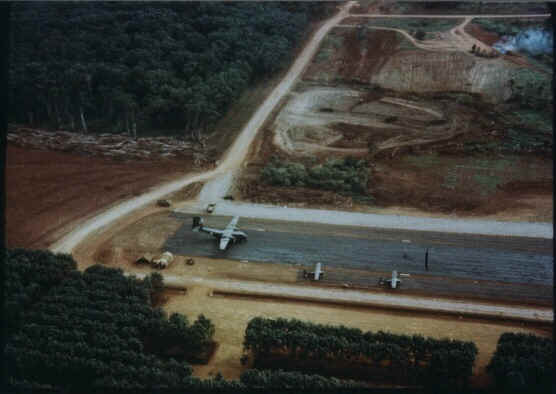 Aircraft parking areas were constructed on the south side of the runway, and a new Task Force Maintenance Area was built between Nui Dat and 6RAR, to the south of the airfields. Development progressed continuously until December 1968 when engineers of the US 34 Engineer Group extended Luscombe Field to 4,100 feet and permanently sealed the whole runway. The pavement of the extension was made from locally won crushed rock and it had been intended to sheath the entire runway with similar material. Since the existing runway had shown no signs of failure or weakness at any time, and since the existing pavement was obviously adequate to the task, the runway re-construction plan was abandoned as unnecessary. Luscombe Field was probably taken for granted by most new arrivals to the Task Force area at Nui Dat. An airfield is to be expected in a well developed task force base. Probably the only comments which were aroused were those which questioned the peculiarities of the airfield or those which wondered where it got its name. Luscombe Field was a monument to much more than Captain Luscombe. It represented many aspects of the part played by the Australian Force in Vietnam. It contributed to the connecting link between the Task Force and its supporting units and commanding HQ. It was the 'front door' of 1 ATF through which thousands of men passed, going to and coming from the war. Luscombe Field was a symbol of co-operation and mutual support between the forces of Australia and the United States; between the Royal Australian Air Force and the Australian Army Aviation Corps; between those who needed roads, buildings, and airfields and those who constructed them - the sappers of the Royal Australian Engineers. This insight into Luscombe Field was written by Major Warren Wilson Lennon (RAE) and published in copy 246 of the Army Journal dated November 1969. Major Lennon was the OC of 1 Field Squadron in Vietnam with 1ATF from 24 May 66 until 09 Dec 66 and then with 17 Const Sqn from 10 Dec 66 until 20 May 67.